Each switching causes progressive erosion of the electron-emissive materials with which the electrodes are coated. The rated life will be achieved only when the frequency of switching does not exceed 8 times per 24 hours. 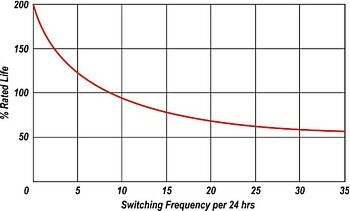 Increased switching frequency can result in a dramatic reduction of life. Conversely the lamp can achieve up to double its rated life if it is switched on only once and never turned off again. The strong inter-relation between switching frequency and lamp lifetime is illustrated in Figure F15 to the right. Once again there are several factors which influence the shape of this curve, most notably the type of control gear on which the lamp is operated. Figure F15 represents the common situation of a magnetic ballast and glowbottle starter. Depending on the type of ballast and starter and the extent of the electrode pre-heating that is foreseen, lamp life can vary dramatically. Instant start type ballasts do not deliver any preheat and can lead to a major reduction in useful lamp life. More modern programmed-start electronic ballasts deliver a highly regulated preheating system and can realise considerable extensions in lamp lifetime by reducing the negative effects of switching on electrode life. Still more advanced electronic ballasts have been developed that deliver a constant voltage for the preheating of the cathodes, instead of the constant current that is normally supplied with conventional magnetic and electronic ballasts. This is important because during lamp life, loss of electrode material decreases its mass and therefore a constant current will lead to a progressive increase in the preheating temperature, which drives the electrode to a swifter death. The more expensive constant voltage system avoids this escalation in preheating temperatures and can deliver a remarkable increase in lamp lifetime. The influence of switching frequency on lamp life must be borne in mind, for instance, when employing fluorescent tubes with movement detection systems for energy saving. The frequent starting can result in a situation where tubes which would normally last for many years are completely worn out within a matter of months, and create a costly maintenance problem. Special systems should be employed which will keep lamps burning for longer periods so as to reduce the effective switching cycle. For further details and advice, refer to LIF Technical Statement No. 2.